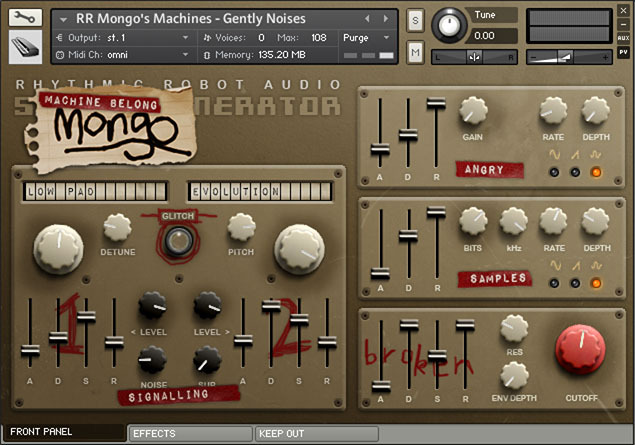 Mongo's Machines – an awesome Kontakt instrument! 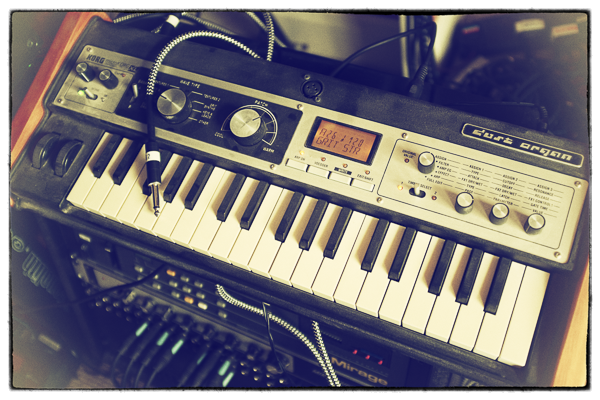 Mongo’s Machines begins by sampling the patches Mongo has programmed on his Dust Organ (which is to say, his own personal MicroKorg, which he has extensively customised). 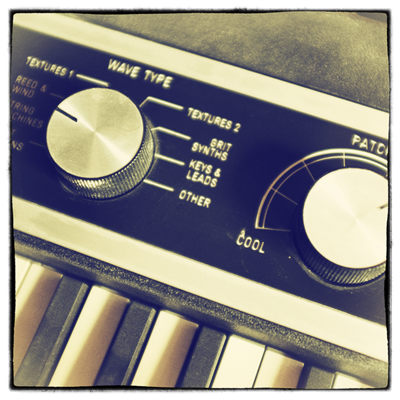 The Dust Organ patches themselves are skewed towards the oddball end of the spectrum and often involve some degree of bit-reduction, waveshaping or drive effects. These starting-point waves then become part of a Kontakt framework which Mongo has lovingly hand-crafted with his very own thumbs. It’s capable of being strange and mournful or randomly aggressive – just like Mongo himself. It is erratic and unpredictable – just like Mongo himself. But unlike Mongo himself, it is cheap to run, fun to work with and doesn’t actually look that bad, considering. The user interface (extensively, um, customised, I’m afraid) incorporates twin oscillators plus noise and sub, with quite a lot of modulation options; and then three further circuits – Angry (some kind of distortion, we believe); Samples (which is a further bit-reduction and mangling stage, with LFO and envelope control over bit depth); and a filter circuit that for some reason has “broken” written on it in red Magic Marker, even though it’s not at all broken and works just fine. (It’s possible that Mongo finds the sound of a four-pole resonant filter too subtle to hear. Or maybe “broken” means something different to him.) There are also some effects round the back, plus a panel labeled “Keep Out“, which we advise you to leave alone. Truly inspiring, unique and fantastic sounds. This very unusual machine fills in some gaps I didn’t know I had. Mongo has outdone himself! An instrument from another sonic realm. You truly never know what you’re going to get when you open this baby up, but you know that it will sound absolutely wonderful; and those are the best things about it. Lots of twisted variation from a surprisingly small footprint in your hard drive. Presets give you a tiny bit of the unexpected range this creature is capable of and they load very quickly. Glitch was made for this puppy – feeling bored by conventionally smooth sounds – spin the wheel and your ears will get twisted in brand new ways! Mongo good, Mongo good! And there I was getting a bit picky, about the level of depth and variability in an early (I think) drum machine, and I put this one on to appreciate and evaluate. And I can only sit there and appreciate, for a good 20 minutes. There is a depth and richness here that is befitting the Mongo namesake. The most beloved glitch/rnd button alone is capable of producing sounds so rare and precarious that you remember why you wish it was everywhere (even in like Word and your email editor). I ended up with a warble so delicate and pure that I could only save the patch and come back here to reassure you that… If you seem to love RR instruments for what they do best, and if this one has been floating in the middle of your wishlist (as it had for me for awhile), then just package it with a cheaper drum machine and go for it as soon as you’re able. Mongo’s got legs. Many hundreds of them. Set them to run in your direction. Sheer madness. It’s a very unusual instrument, but it makes unique sounds and that’s what I was looking for, The product of a diseased mind, thank goodness. Weirdly beautiful noises. I didn’t know what to expect when I bought this, and I don’t know what to expect when I use it – it’s weird in a wonderful way. I was a bit surprised that many of Mongo’s machines sound rather beautiful, but as we all know, you can’t judge a book from its smell, and there is plenty of both weirdness and beauty here. This creation is for the most part easily understood (it weebles, mushes, swooshes and swirls, you see), and it’s AFAIK the first RR-instrument that actually randomizes the controls also on the Effects page when you push the Glitch button (hurrah! ), so making new sounds is really easy and fun. You can get some kind of polyrhythmic thing going when using both the Angry and Samples LFOs at the same time with different speeds. I wish the Saw and Sine waveforms had the opposite phase, cause when you bitcrush a lot and the speed is somewhat low, you start with silence when you press the keys. Dialing the Phase knob under the hood to 180 fixes this for the Sine, but Saw is still silent at the start. There are unfortunately two knobs that don’t work: Mush phase doesn’t do anything at all, and Mush speed just sets the corresponding chorus … I mean Mush speed knob under the hood to 2.2 Hz (if you’ve tweaked it). Reported the bug to RR late 2017. This has really got a mind of its own, but the results are great. Don’t use it as a bread and butter synth – you’ll never recreate the same sound twice, but just stick on a random preset and increase the grit! This thing was a bit hard to review because it’s a bit, well… unusual, obviously. It’s hard to describe because of its resulting sound, but the instrument itself is not complicated (even though the somewhat inscrutable GUI sometimes seems to control somewhat inscrutable things…). You get two layers of sound (28 sample sets of all manner of strings, organs, pads, and the like) plus noise and sub, and this blend goes through a modulated distortion, a modulated bit crusher, then a filter (with optional effects, of course). Weird. Hats off to Mongo because the modulated distortions are a stroke of genius (or madness, probably) — what comes out is a sort of almost undefinable sonic soup that blurs the line between organic and synthetic, often on the verge of breakup — as if the electricity producing the sound is about to give out at any moment. It sometimes seems to have a life of its own, and it absolutely excels at dirty, dusty, thickly-layered, moving pads that frizzle out along their edges. At no point does it sound like an analog synth in any traditional sense, and you’re not going to break this thing out for any kind of task that requires precision (or control for that matter…), but if you’re looking for something a bit unpredictable and chaotic, then Mongo’s got ya covered. You can get some wonderful sounds out of this thing once you learn to tame it a bit.